I’ve had many people ask me now and again what I thought about the REN Ready Steady Glow Daily AHA Tonic, and I’ve often been a little uncertain. As much as I think it’s effective for what it does, this isn’t a product that works impressively well for me. The REN Ready Steady Glow Daily AHA Tonic comes under the Radiance range, which offers to help your skin maintain or attain radiance, depending on how dull your skin is. Aside from the REN Wake Wonderful Night-time Facial, which I particularly enjoy using, I regret that I haven’t had much luck otherwise from this range. 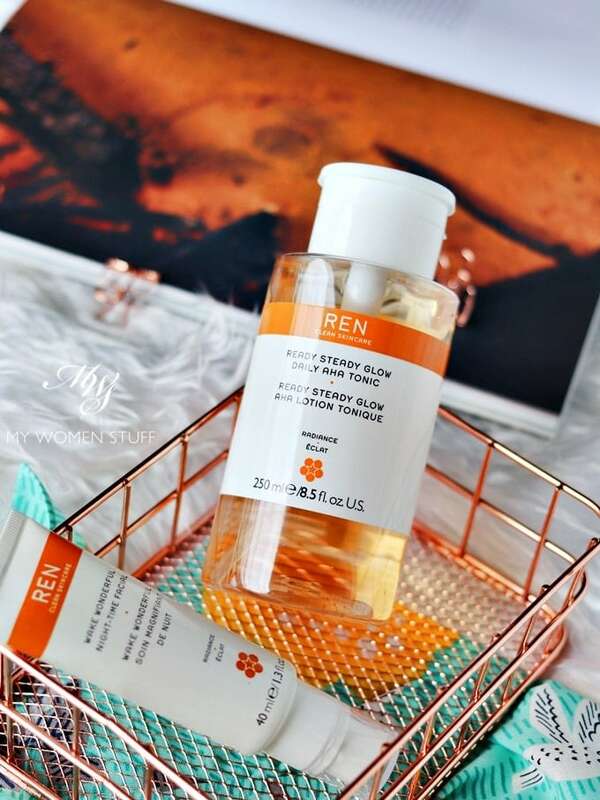 What the REN Ready Steady Glow Daily AHA Tonic promises, is to gently exfoliate your skin, using lactic acid and willow bark extract. Lactic acid is one of the most gentle of alpha-hydroxy acids (AHA). For those who may find glycolic acid too strong for their skin, lactic acid is usually a good place to start. Willow bark extract gives us salicylic acid (beta hydroxy acid – BHA) which can help unclog pores and dry up spots. It also contains Azelaic Acid Precursor, which is supposed to prevent melanin production, that helps brighten your skin tone and address uneven skin tone and dark spots. So this really operates as an all in one “toner” lotion, to brighten skin tone and improve radiance and clarity of skin. The REN Ready Steady Glow Daily AHA Tonic is also supposed to be gentle enough, that you can use it daily. And it comes in a generously sized 250ml bottle, at a pretty decent pricetag. On paper, I thought it was quite wonderful. In practise however, I regret that I wasn’t quite impressed nor blown away by this acid toner. I did not find it particularly gentle, to begin with. I found that daily use would make my skin feel a little more stripped than I like. So, I eventually dialed down to use it on every alternate day instead. I now think that it might be due to the willow bark extract, for BHA can be more drying for my skin. However, if you have combination, oily or congested skin, then this would make a good all in one product, to address clogged pores while providing gentle exfoliation. By contrast, I feel that Pixi Glow Tonic, even if used daily, does not strip my skin as much. It might be to do with their ingredients, which contain some hydrating ingredients like aloe vera and glycerin, which balances it off better. I also unfortunately did not experience the sort of skin clarity and radiance that I was promised. It should be noted that AHA lotions I regularly use in rotation are Lotion P50, Pixi Glow Tonic and the occasional overnight treat with Alpha-H Liquid Gold. All these give my skin a noticeable lift in texture, appearance and clarity. During the time that I was using the REN Ready Steady Glow Daily AHA Tonic, I did not notice as obvious an improvement. Might it be because it is a more gentle formula? I’m not sure. What I do like however, is the packaging. It comes in a bottle, with a handy pump. You may recognise this from some nail-polish remover bottles. You flip off the cap, then use a piece of cotton pad, depress twice (twice is optimum for me. Once leaves your cotton pad too dry. Three times is far too wet) and then wipe it all over your face, neck and decolletage. After that, follow up with the rest of your skincare. There is a citrus scent that I don’t favour. I generally do not favour citrus scents in my skincare (nor any scent for that matter) but it’s there, and most people find it refreshing. I have this, and I use it, and I will eventually finish it. But this is not one I love nor will repurchase. That said however, I do think that this REN Ready Steady Glow Daily AHA Lotion is a good one if you’ve never used an acid toner and are looking for one to start with, or if you have combination or oily or congested skin. I think these skin types will benefit most from using this lotion. But if you use Lotion P50 or even Pixi Glow Tonic, then I do feel like this is a step down. The REN Ready Steady Glow Daily AHA Tonic is a fairly gentle exfoliating toner. Its key AHA acid is Lactic Acid which is fairly gentle on skin. It also contains willow bark extract, that is a natural salicylic acid (BHA) that helps unclog pores and dry up spots. I feel that this is a good starter acid toner for someone who maybe new to using acid toners. I also think it may best suit someone with oily, combination or congested skin, or someone who cannot use glycolic acid. I personally find it a little more drying than I like, and it did not give me the results I desired. But mileage will vary as this is a product that comes very highly rated by most experts in the industry. 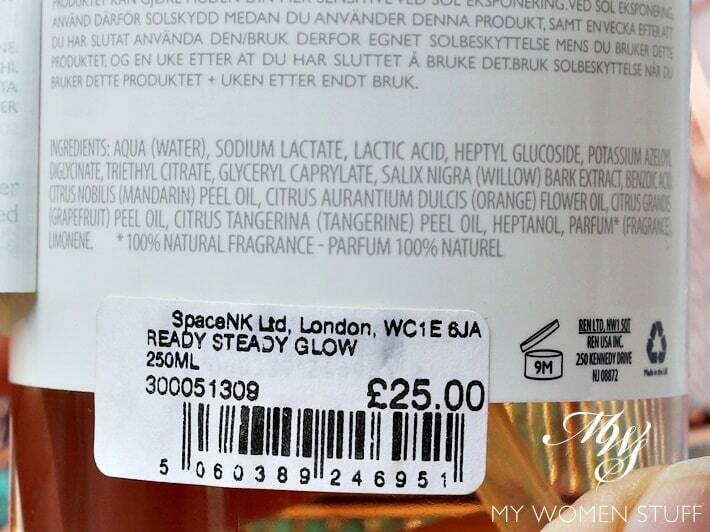 Here is the ingredient list for the REN Ready Steady Glow Daily AHA Tonic for those interested. Personally, I feel it could do without the citrus extracts and scent. But as I always say, scent is very personal, and from what I can tell, that is one reason why people enjoy using this. It certainly does not smell as bad as Lotion P50 (for those of whom finds it smells bad. I don’t). 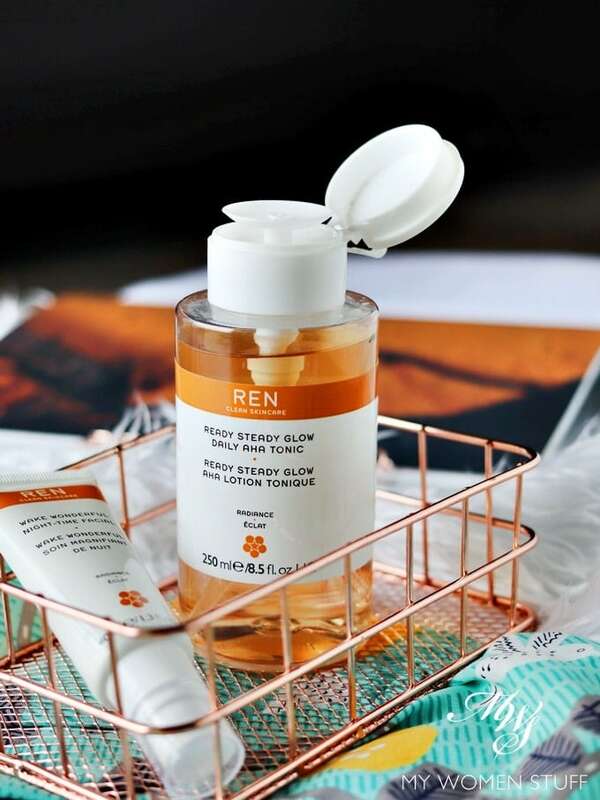 Have you tried this REN Ready Steady Glow Daily AHA Tonic? Thoughts? PREVIOUS POST: The Excel Powder & Pencil Eyebrow EX is an award-winning product and I fully agree! I was expecting a glowing review on this one – too bad it didn’t work out for you! The ingredients sound wonderful (I love willow bark) so I might give it a go when I get through my extensive acid collection, but the P50 toner is next on my purchase list. To be fair Angela, I was expecting to love it too! Was quite bummed when I didn’t. But I do think it’s a pretty decent product, just maybe not for me. And if you can get your hands on Lotion P50, get it! It’ll be the only one you ever need… or want! Paris, thanks for the detailed review. Very timely as I’m looking through the various exfoliating toners to start adding acid into my routine. However, how is this different from the Ren Clarimatte Clarifying Tonner that you have reviewed? Ahh… I see. I think I will give this a try. Thanks for the explanation.? ?